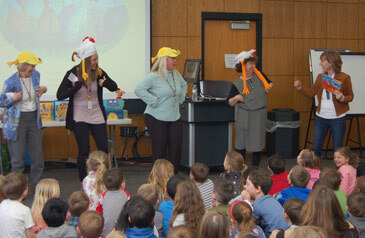 Each spring, the OEF and Horizon Bank team up to bring an author to our elementary schools. 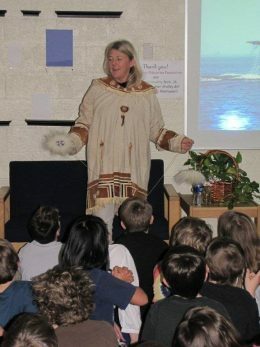 This author spends one day in each of our four buildings, giving presentations to our students. 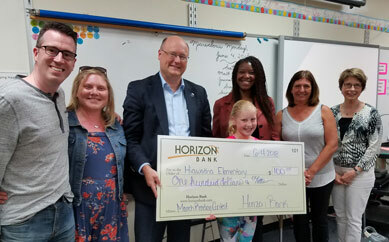 Thank you, Horizon Bank, for your generosity in helping the OEF bring this valuable educational experience to Okemos students. 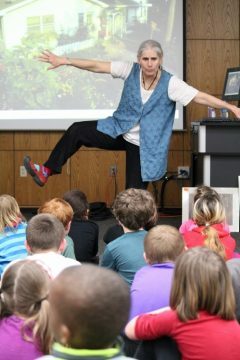 Kalamazoo-based children’s author Leslie Helakoski had students counting, dancing, and reading aloud as she shared several of her books, including a long-anticipated sequel to her popular title “Woolbur,” which will be available in bookstores summer 2018. She shared the inspiration for her characters (often her siblings) and how readers can learn a lot from the illustrations: the cover often shows the story’s plot and the dedication page introduces the setting. 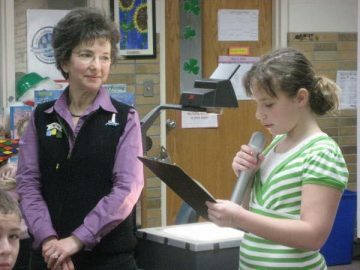 She encouraged students to keep reading and to write their own stories. 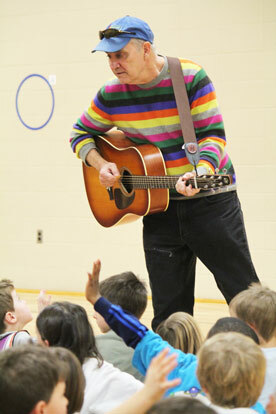 “When you write a story," Helakoski told the students, "you are a superhero because you can make anything happen.” A writer can change the story around, swap out common words for more creative ones, and make improvements to the story or illustrations through the editing process. 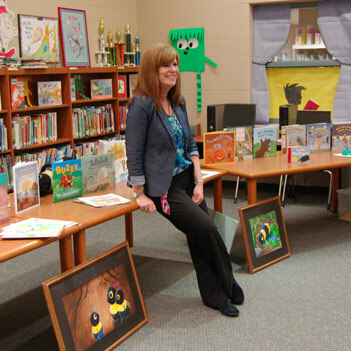 Ms. Helakoski has had 10 picture books published over her 15 year career as a children’s author, with two more titles scheduled for publication and even more in the works. Learn more about Leslie Helakoski on her website: www.helakoskibooks.com. 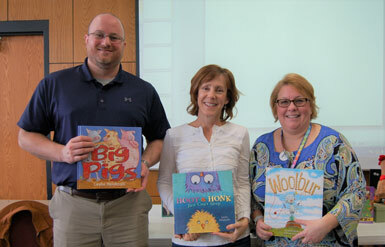 Horizon Bank holds a reading contest each spring. The Grand Prize Winner receives a full piggy bank, a pizza party for the classroom and a donation to the school's library. 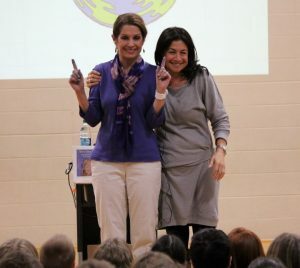 Brennan-Nelson encouraged students to keep a journal. “Ideas come at us all the time. Be ready for them.” The author showed students a stack of her own journals, one started at age 10, another begun in 1932 by her grandmother. 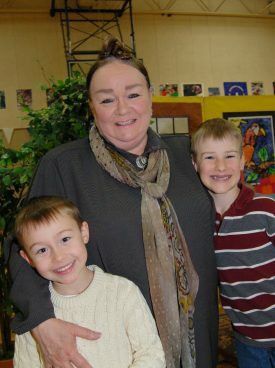 “She wasn’t an author,” Brennan-Nelson told students,” but her journal is the best story I’ve ever read.” Brennan-Nelson makes the point that writing isn’t just for authors: “Everyone is a writer because no one else can tell your story.” Learn more about Ms. Brennan-Nelson and her work . 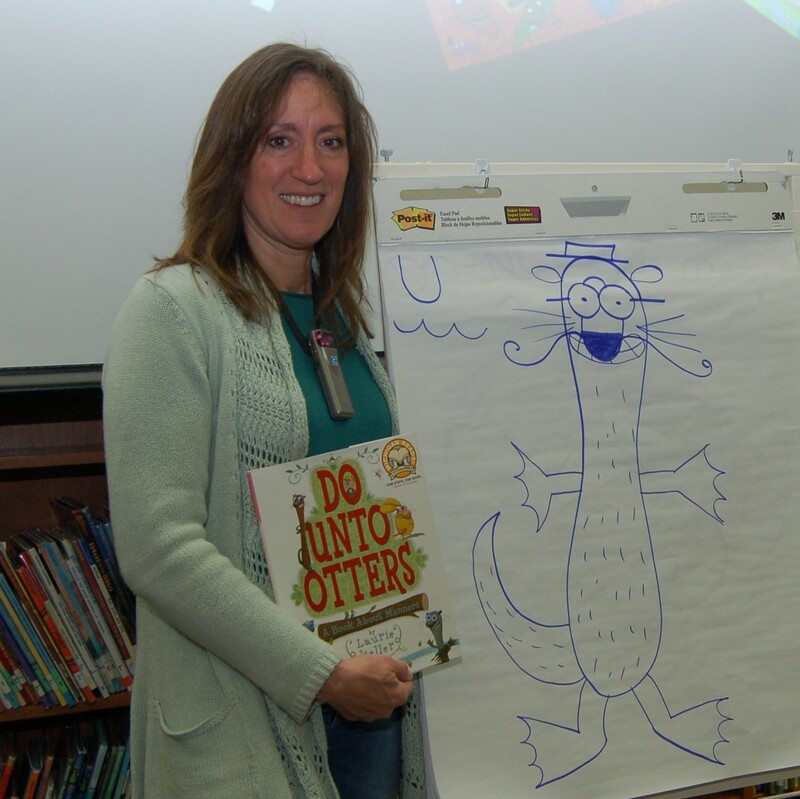 Okemos students were already familiar with Michigan author/illustrator Laurie Keller’s work, since her popular title Do Unto Otters (a book about manners) is a 2015 Michigan Reads! Featured Title. Keller shared how she develops story ideas, the importance of editing (over and over again! ), and she gave step-by-step instructions on how to draw two of her beloved characters: an otter and Arnie the Doughnut. Students drew along with her and left with their very own versions of her characters to take home. 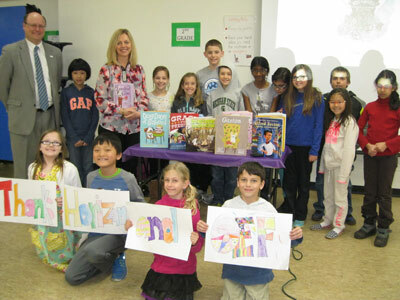 Michigan author, Kelly DiPucchio, visited our elementary schools for “March is Reading Month” in 2015. 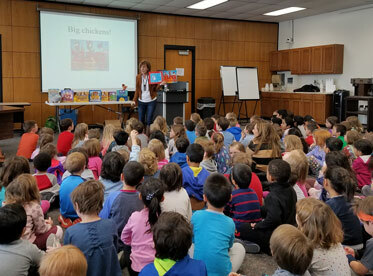 She did 3 presentations in each building over 4 days, reading a few of her titles, as well as sharing how she got the ideas for her books, about the process of writing a picture book, and the importance of editing and rewriting. 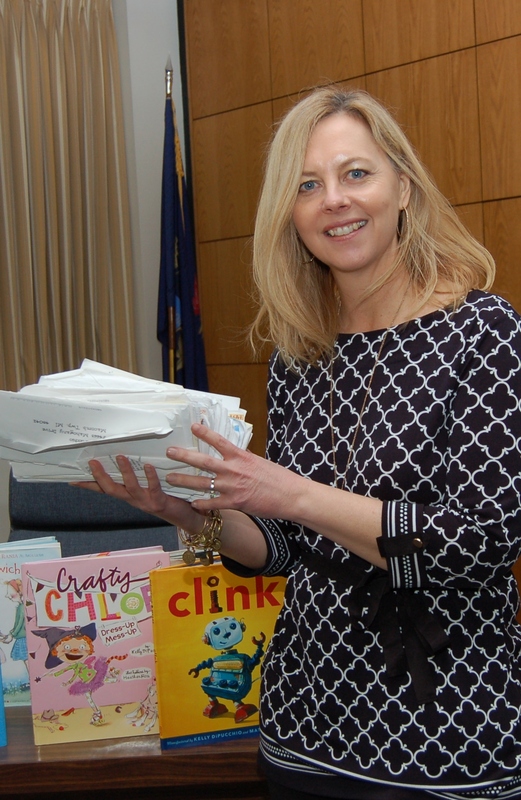 The photo shows Kelly holding the 200+ rejection letters that she has received over her career. “Do you think I ever wanted to give up? Yes, I did. But I kept at it because I love writing stories and if I had given up, I wouldn’t have had all these books published.” Ms. DiPucchio has authored more than a dozen popular titles. “Everybody Loves Bacon” is released in September 2015. 2009 Denise Rodger "The Poetry Lady"